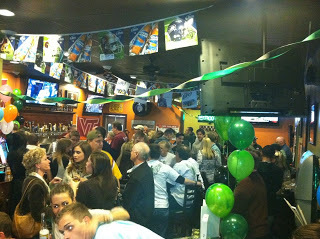 Last Saturday, December 3rd, we held our very first fundraiser at Buffalo Wing Factory in Ashburn and it was a HUGE success! We went into it with the expectation of raising $2,000 to cover shipping costs for holiday boxes for the troops, but with everyone’s love and support we raised almost $5,000!! We were overwhelmed with joy to see everyone in attendance and it truly warmed out hearts to see so many people who want to support the men and women serving our country. Thank you all so much for bringing along your friends and families. Now for the thing you all are probably most interested in – the raffle winners! We have already announced this on our Facebook page, but in case any of you didn’t catch that, we want to say it again here (and go Like our Facebook page so you can receive more timely updates!). The winners are…. Thank you all again for coming out and showing your support at this first fundraising event. We will have some pictures on our Facebook page soon for everyone that wasn’t able to make it. We had tons of fun! As we put one event behind us, we have another quickly approaching! We have been collecting goods for almost four weeks now and we have already had a number of items donated. Aside from Jeannie Jarrett and her team from Keller Williams donating over 20 stockings filled with goods, we have also had a women’s group from the area take on a similar task and they have donated around 20 stockings as well. On top of that, our good friend Tyler Sue Rauer, has reached out to her clients who have been donating day after day. We also have boxes out around the community in Northern Virginia, DC, and West Virginia that have been doing very well. THIS Friday, December 9th, will be the very last day we are collecting goods. If you have a collection box that you need a pick up for on Friday, please e-mail us at info@dontstopbelieving.us or call Alicia at 571-236-7426 as soon as possible. ALL boxes and goods will need to be collected by Friday. DJGMF will sort all the goods Friday night for our packing day on Saturday. On Saturday, December 10th, DJGMF along with 50 students of the PFHS Senior Class Student Advisory Board, will be stuffing stockings and packing up boxes to be sent out on Monday. Since the senior class at Potomac Falls High School has taken this on as their project, we are all set for volunteers on Saturday. For those of you who were hoping to come out, please know that we will have future packing days where we will need your help. Just keep an eye out for details in the future. Thank you all for your understanding and support, but having more than the 50 PFHS students would cause chaos and confusion and we are trying to keep the packing day as organized as possible. Last week, our amazing friend Nick Caracciolo put a brochure together with information from this blog to hand out to members of the community who wanted more information. If you have been wanting to tell friends and family about our organization, and would like to pass this along, just shoot us an e-mail and we will be more than happy to send it over. On top of previous donations we have received, we had many more supporters make generous donations this week. Thank you to the following organizations/individuals for your contributions! If you have been wanting to make a donation, you can! For those of you who wish to contribute in some way, but are unable to contribute your time, you can make checks out to Douglas J Green Memorial Foundation and send them to the address below. Our landing page for our website should be up soon, which will also have a donate button to make it easier to donate online! We just wanted to take out a second to thank everyone that has been involved in this organization up to this point. You have been a huge factor in our success thus far, and have really helped us get this foundation off of the ground. With everyone’s help we will now be able to get on our way with sponsoring soldiers from the local area. So thank YOU for being a part of this and believing in us from the beginning.